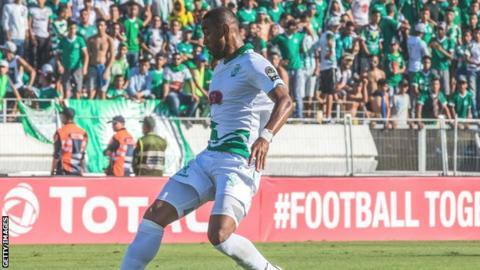 Moroccan side Raja Casablanca will be without forward Moussine Iajour for the second leg of their African Confederation Cup final against DR Congo's As Vita Club on Sunday in Kinshasa. Iajour has been banned for three continental club matches by the Confederation of African Football (Caf) for an incident at the end of Sunday's first leg, which Raja won 3-0. The first match he will miss is the second leg of the final after Caf ruled that "he was expelled at the end of the match for giving a violent head shot to a player of AS Vita Club." Raja were also fined a total of US$10,000 for their fans throwing flares, bottles and other projectiles during the first leg. The flares gave off enough smoke to see the game stopped for almost three minutes following Raja's first goal. Caf pointed out that "bottles and other projectiles have been thrown by the Raja Club fans on the technical surface and on the pitch several times before and during the match."